When I was a young, strapping lad, I nearly qualified for the Olympics in the very popular event of Underwater Basket Weaving. They called me a phenom in the sport, but an unfortunate sprained left thumb prevented me from fulfilling my dreams. Now, watching the 2012 London Olympic games reminded me of those days and the dietary restraints that I, and indeed all such athletes (except for that robust-looking American sharpshooter lady) must deal with. In celebration that I no longer must repress my sweet tooth to such a degree, I decided to indulge on these shortbread cookies while enjoying the spectacle of the fittest humans in existence competing on the world's biggest stage and performing feats of athletics that even great warriors such as I could scarcely perform in my prime. Apparently, each tiny cookie has approximately 11% of your daily saturated fat. Each cookie. Talk about indulgent. The good news is, they taste like they have 11% of your daily saturated fat. In other words, they're worth it...almost. Sonia wanted them to be "softer." I'm not sure what she means by that. They're not hard. They're made of shortbread, and they have the consistency of shortbread. Really buttery shortbread. We both wanted them to have more fruit filling because we both like raspberry and apricot fruit stuff. 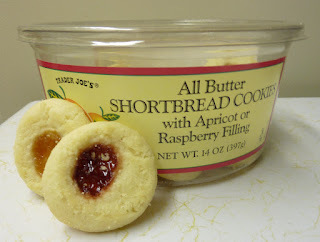 But fortunately for raspberry and apricot-haters, a love of those two fruits is not requisite for loving the taste of these cookies, because you can barely taste the fruit. There's a slightly gelatinous texture in the center of each cookie, but any fruit flavor that might be there is slathered in a pound of butter and lost in the sweet cookie goodness. In short, these guys are a nice treat for a party or something, but if we had these in the cupboard on a regular basis, I'd weigh 300 pounds. And honestly, I'm not sure if I'd want to waste my precious allocation of fat and calories on something with such a one-dimensional flavor. A big boost in the fruit department would have helped these cookies immensely. I give 'em a 3. Sonia gives them 3.5.
yep 2 cookies is max serving, or maybe its 2 containers? These are really good... but the ones with chocolate in the center are even better! Thanks for the recommendation Sarah. We'll have to check out the chocolate ones next time. I look at these longingly every time I go, but cookis like these can be really good or really dry and tasteless. They are the most delicious cookies ever! I work at a law office and a doctor rep. usually brings this AMAZING cookies. We always are looking forward to her visit! AMAZING!! is the best word to describe this cookies! !